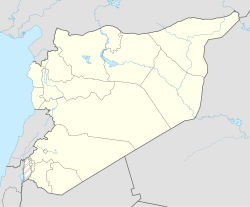 Shaizar (Arabic: شيزر‎; in modern Arabic Saijar; Hellenistic name: Larissa in Syria) is a town in northern Syria, administratively part of the Hama Governorate, located northwest of Hama. Nearby localities include, Mahardah, Tremseh, Kafr Hud, Khunayzir and Halfaya. According to the Syria Central Bureau of Statistics (CBS), Shaizar had a population of 5,953 in the 2004 census. During the Crusades, the town was a fortress, ruled by the Banu Munqidh family. It played an important part in the Christian and Muslim politics of the crusades. Shaizar is located at a strategically vital crossing point on the Orontes River, 28 km to the northwest of Hama. In the Amarna letters (14th century BC) itis mentioned as Senzar or Sezar. To the Greeks it was known as Sidzara, but during the Seleucid empire it was renamed Larissa, after the town of the same name in Thessaly from which many colonists came. It reverted to its earlier name under the Roman Empire and was known as Sezer under the Byzantine Empire. The Crusaders rendered the city's name in Latin as Caesarea. This name had not been used in any earlier period, and was derived from the Crusaders mistakenly identifying this city as being Caesarea Mazaca, a place renowned in Christian history as the home of Saint Basil of Caesarea. Shaizar's ruins are known as Saijar in modern Arabic. Shaizar is mentioned as Senzar or Sezar in the Amarna letters (14th century BC). The region was conquered by Alexander the Great in 333-332 BC. Diodorus Siculus (first century BC) records local legends attributing the establishment of the town by one of his cavalry regiments originating from Thessaly. During the Seleucid dynasty the town was renamed Larissa, after the town in Thessaly from which many colonists came. The Roman armies led by Pompey conquered Syria in 64 BC. Syria was briefly occupied by Republican-Parthian forces under the Parthian prince Pacorus I. The city remained part of the Christianised empire, known as the Byzantine Empire, under the name of Sezer. Shaizar fell to the Arabs in 638 and frequently passed from Arab to Byzantine control. It was sacked in 969 by Byzantine emperor Nicephorus II, and was captured by Basil II in 999, after which it became the southern border of the Byzantine Empire and was administered by the Bishop of Shaizar. A Fatimid castle was standing at Shaizar by the time the Byzantines recaptured the town. It was lost to the Banu Munqidh in 1081 when 'Ali ibn Munqidh bought it from the bishop. The Byzantines besieged it numerous times after this but failed to recover it. The Crusaders arrived in Syria in 1098 during the First Crusade. The interaction between the Crusader states and the Banu Munqidh rulers of Shaizar consisted of a series of wars and alliances. The Munqidhites controlled territory east of Shaizar, across the al-Ansariyah mountains to the Mediterranean coast, from the coastal cities of Latakia in the north to Tortosa in the south. During the First Crusade, the emir assisted the crusaders passing through his land, giving them horses and food and other provisions. After the crusade it was bordered by the crusader Principality of Antioch and was subject to raids from both Antioch and the County of Tripoli. When the Crusaders briefly conquered Qalaat al-Madiq, a fortress to the northwest of Shaizar and overlooking ancient Apamea, in 1106, the Banu Munqidh clan harasseed them from their base in Shaizar. In 1106 the Munqidhite emirs Murshid and Sultan defeated William-Jordan of Tripoli, and in 1108 and 1110 they had to bribe Tancred of Antioch to leave. In 1111, Tancred, Baldwin I of Jerusalem, and Bertrand of Tripoli besieged Shaizar for two weeks, but returned home when the army of Mawdud of Mosul cut off their access to food and water. Tancred nevertheless built a castle nearby on Tell ibn Ma'shar, in order to keep Shaizar under close watch. When Ridwan of Aleppo died in 1113, Shaizar was attacked by his Hashshashin supporters. Shaizar participated in Ilghazi's campaign against Antioch in 1119. When Baldwin II of Jerusalem was taken captive by the Ortoqids outside Edessa in 1123, he was held at Shaizar until his release the next year; as part of his ransom he was forced to give up his daughter Ioveta as a hostage, who was also held at Shaizar until her own ransom in 1125. As Shaizar was a friendly state, Baldwin was allowed to visit his daughter there, but Shaizar was also friendly to its Muslim neighbours, and in 1125 was incorporated into the territory of Bursuq (Aq Sunqur al-Bursuqi) of Mosul. When Zengi succeeded in Mosul in 1127 and claimed Aleppo as well, Shaizar recognized his suzerainty. In 1137, Byzantine emperor John II Comnenus arrived to impose Byzantine authority on Antioch, and promised Raymond of Antioch a principality consisting of Shaizar, Aleppo, Homs, and Hama if Antioch was returned to the Empire. In April the Byzantine army besieged Shaizar, but Raymond and Joscelin II of Edessa did not assist the emperor, and Zengi soon arrived to relieve the fortress in May. The emir preferred Byzantine control to Zengid, and offered to recognize John as his overlord. Neither John or Zengi ever really enforced their authority there and Shaizar remained independent. The emirate lasted until the enormous earthquake of 1157, during which the citadel collapsed, killing almost the entire family, who had assembled there to celebrate a circumcision. The only survivors out of the whole family were the wife of emir, and the emir's nephew Usama, the famed poet-knight who was on a diplomatic mission to Damascus. "The city of Shayzar lies upon the same Orontes river which flows by Antioch. It is called by some Caesarea, and by them is believed to be the famous metropolis of Cappadocia over which the distinguished teacher St. Basil once presided; but those who hold this view are in grave error. For that Caesarea is a fifteen days journey or more from Antioch. This city is in Coelesyria, a province which is separated from Cappadocia by many intervening provinces. Nor is the name Caesarea, but rather Caesara. It is one of the suffragan cities belonging to the patriarchate of Antioch. It is very conveniently situated. The lower part extends along the plain, while upon the heights of the upper part is the citadel, fairly long in extent but rather narrow. It is well fortified, for in addition to its natural defenses, the river protects it on one side and the city on the other, so that it is entirely inaccessible." Fulcher of Chartres, an eyewitness to the siege in 1111, did not know the classical Roman or Greek name for the site, and noted that the Turks called it "Sisara", "but the inhabitants of the country commonly call it 'Chezar'." Regarding the citizens, William says they "had but little knowledge of arms; their attention was devoted almost entirely to trading." Many of them were Christians, whom William considered to be suffering as slaves under their Muslim rulers, but the Munqidhites seem to have been tolerant lords and both Christians and Muslims of various sects lived there peacefully. A very lively account of life in Shaizar, and various other places in the Muslim world, was written by the prince Usama, titled Kitab al-I'tibar, and gives great insight into Muslim life in the 12th century. The Munqidhite emirs are shown as patrons of literature, who delight in hunting and other sports, as well as delighting in making war on, and negotiating peace with, their Christian and Muslim neighbours. Taj ad-Dawla Nasr ad-Din Muhammad ibn abu-l-Asakir ibn Munqidh (1154-1157). Usama ibn Munqidh was a medieval Muslim poet, author, faris (knight), and diplomat from the Banu Munqidh dynasty of Shaizar in northern Syria. His life coincided with the rise of several medieval Muslim dynasties, the arrival of the First Crusade, and the establishment of the crusader states. He was born in Shaizar, Şeyzer. He was the nephew and potential successor of the emir of Shaizar, but was exiled in 1131 and spent the rest of his life serving other leaders. He was a courtier to the Burids, Zengids, and Ayyubids in Damascus, serving the Zengi, Nur ad-Din, and Saladin over a period of almost fifty years. He also served the Fatimid court in Cairo, as well as the Artuqids in Hisn Kayfa. He travelled extensively in Arab lands, visiting Egypt, Syria, Palestine and along the Tigris River, and went on pilgrimage to Mecca. He often meddled in the politics of the courts in which he served, and he was exiled from both Damascus and Cairo. The Hashshashin then took control of the ruins, and they were defeated by the crusaders in 1158, but disputes forced the crusaders to abandon the siege. Nur ad-Din Zangi then incorporated the remains into his territory and rebuilt the city. Shaizar was destroyed again by an earthquake in 1170 and the remnants were taken by Saladin in 1174. They were rebuilt again, but in 1241 the city was sacked by the Khwarezmians. The Mameluk sultan Baibars captured and rebuilt it in 1260. Shaizar castle is no longer inhabited today. [dubious – discuss]. ^ William of Tyre, A History of Deeds Done Beyond the Sea, trans. E.A. Babcock and A.C. Krey, Columbia University Press, 1943, bk. 18, ch. 18, pp. 266-267. ^ Fulcher of Chartres, A History of the Expedition to Jerusalem, trans. Frances Rita Ryan, University of Tennessee Press, 1969, bk. II, ch. XLV.7-9, pp. 202-203. Wikimedia Commons has media related to Shaizar.